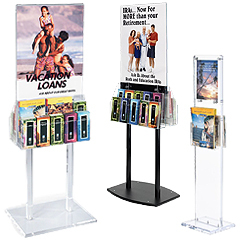 Offered here is our entire selection of acrylic and plastic pamphlet holders. Wall mount or floor standing, table or countertop, these offerings come in single and multiple-pocket models. 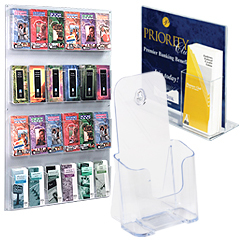 With hundreds of our best selling products in one place there is surely a literature display that meets the needs of your business. Most models feature acrylic or injection-molded plastic as the predominant fabrication material. 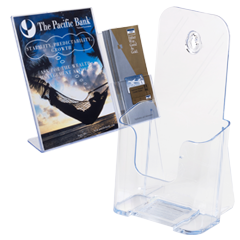 Thanks to the material's low cost, these plastic brochure holders also offer some of the lowest prices available (especially when purchased in bulk). Here at BrochureHoldersNow, we take pride in our ability to help your business. Providing informative content, financial rates, new product information, or simple reading material creates the bridge between a business and its customers. 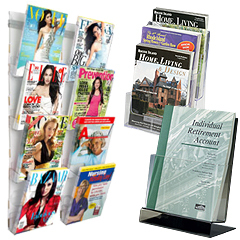 The large variety of racks and pockets available here come in floor standing styles and wall mounts, as well as countertop offerings with small footprints. Some of our brochure holders even feature custom logo imprinting that takes marketing your business a step further. The recurring theme of "clear plastic construction" allows your printed content to be seen in their entirety. Inserting folded pamphlets into a clear pocket ensures the viewer will see your content no matter what. Our brochure displays will project professionalism while helping you as a business communicate with your target audience.